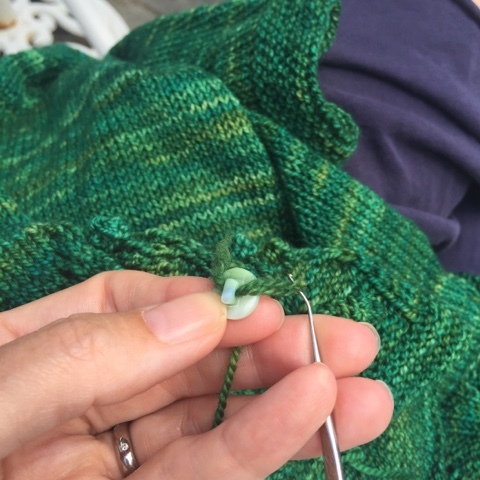 What do you do when your needle won't fit through your delicate button's holes? Ugh, this happens to me more often than I would like. 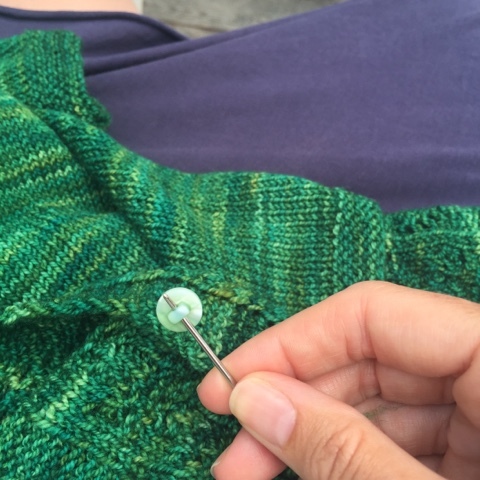 Sometimes I search through my tapestry and sewing needles to see if I can find one that will sneak through, but then I start to worry that I won't be able to thread the yarn onto said needle. 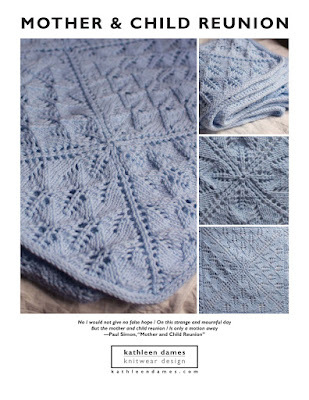 And I do worry that using sewing thread might cut through the knitted fabric. Call it paranoia. 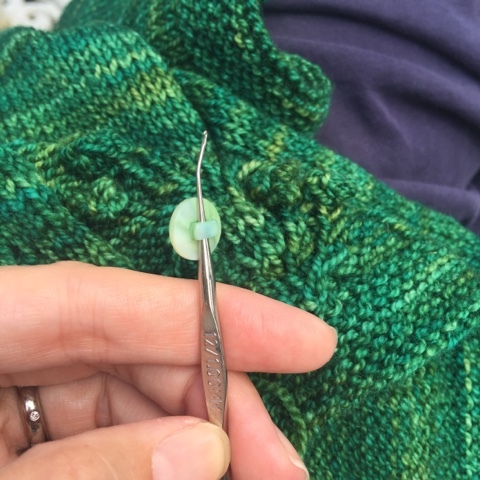 oh, tapestry needle, why you so big? 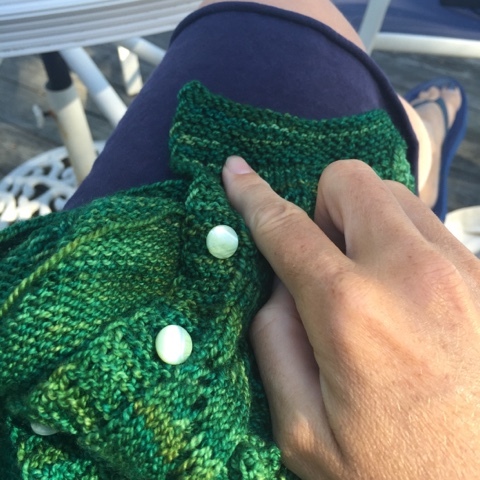 Not too long ago, though, I realized that I could make use of my ridiculously tiny crochet hook, used to add beads to my Emily 2 shawl to snag (carefully) the yarn and pull it through the small holes on the buttons in question. 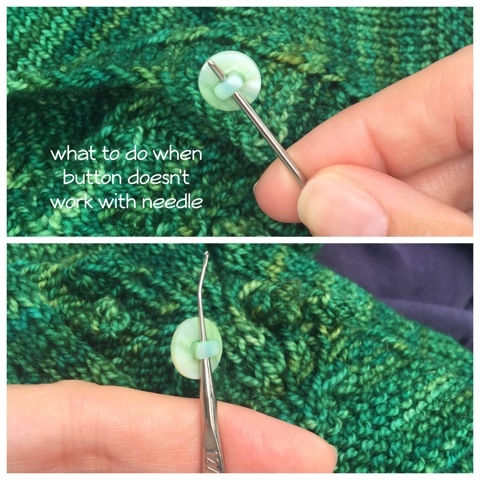 Of course, this means I can't do my usual button attachment technique, which involves a long piece of yarn and weaving my way up the back of the button band to attach the buttons at regular intervals. But that's OK.
uh-oh, where's that last button?! If you follow me on Instagram, you may have seen my panic about a missing button. Luckily, after turning my various project bags upside-down and inside-out, I found the little, precious thing. At the bottom of the project bag that holds the other project bags. But, yikes!